Should You Let Kids Run a Lemonade Stand? The lemonade stand is a popular first job for kids. The price per cup has gone up, but the lessons on a hot summer day are still very valuable for children. Of course, it will up to you, the parent, to decide whether your neighborhood is a safe place to run a lemonade stand and whether such an enterprise requires a license of any kind in your town. You may want to work with your children to determine the best location for thirsty foot traffic, develop a list of items needed to make and sell the lemonade (or any other items), and craft a budget for capital expenses. Another question to settle together is -- who pays for the lemonade, cups, and other materials required? This is a great opportunity to discuss the concept of net versus gross income! Creates entrepreneurial spirit: Your child will be his own boss, set his own price, and run the show. It's a great introduction to running your own business. Flexible: He will be able to choose the day and time of his lemonade sale. In addition, if the weather is bad, he can reschedule for a different day. Various ages: Your younger children can run a lemonade stand with help from mom and dad, while older children can run it themselves. Limited start-up costs: The ingredients for lemonade are cheap, so your child should be able to recoup his investment with a handful of sales. 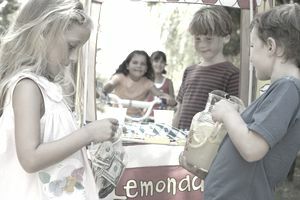 Establishes credibility: A lemonade stand is a great way for your child to meet neighbors in a business setting. They may be willing to offer him other work, like lawn mowing, if they see his drive and responsibility. Limited ongoing business: Running a lemonade stand a couple of times during the summer will be fun. However, there probably isn't enough business to run it regularly. Location matters: Setting up a lemonade stand near a bike path or big summer event will probably draw many customers; holding it on the front lawn in a rural area will not. Your child will need to be aware of the limitations that each location has. Weather: The success of the lemonade stand will also be based on the weather. On a hot day, sales should be high. On a rainy day, it's probably best to skip the sale. Limited pay: While a lemonade stand is fun, and can be very profitable for the day, there is limited potential for total income over time. If your child plans to use the summer to earn money for a large purchase, he might want to explore other jobs to supplement his pay. Profit and loss: Your child will learn a very valuable lesson about pricing. The price of his lemonade will determine how much he or she can sell if he will recover his investment in ingredients, and the amount of profit. Making business decisions: Your child, as the business operator, will be forced to make many of the management decisions for his business. He'll learn that his decisions ultimately impact the success of the business. Teamwork: Children often decide to run a lemonade stand together. If they do so, they'll need to learn to work together to make decisions and share the pay.